This is the third of our book reviewer Steve Pressman’s live-blogging posts on Thomas Piketty’s Capital in the 21st Century. His first post appears here. My first stab at examining the reviews of Piketty took cuts at those who failed to read the book but felt they had the right to express an opinion about it. Today I look at positive reviews of Capital in the Twenty-First Century. In general, the book has garnered critical acclaim. Most of the early reviews were glowing. Reviewers were virtually unanimous in praising the book for being so well written and well translated. They also wrote about Piketty’s careful collection of economic data, from numerous countries, going back in time for a century or more, and for his clear presentation of historical trends. Finally, reviewers admired Piketty’s breadth and erudition. Many noted, approvingly, references to Jane Austin and Balzac’s Père Goriot, something atypical for an economist. How could anyone not want to read Piketty’s new book after reading comments like this? A few reviewers provided a bit more idiosyncratic reasons for liking Capitalism in the Twenty-First Century. Lynn Parramore, writing at Alternet, praises Piketty for giving “right-wingers in America the willies”. And Steven Erlanger, writing in the New York Times on April 19th, praises the book for daring to ask big questions and for questioning the conventional wisdom concerning income inequality. Of the many positive reviews, three stand out as being the most informative and useful. These reviews (by Paul Krugman, by Branko Milanovic, and by Robert Solow) are worth reading– whether or not you take the plunge and read Piketty. All provide clear summaries of the book and highlight what makes it so important. Krugman, as is his style, minces few words in his May 8th New York Review of Books article (Why We’re in a New Gilded Age). He contends that the book will “change both the way we think about society and the way we do economics” and then points out several ways that the book advances our knowledge of income inequality. First, and most important for Krugman, Piketty shows that the very wealthy (the top .1%) have for the most part not earned their income. They tend to be rentiers—they have inherited their wealth. Their income mainly comes from owning capital rather than working. Having a very high income is therefore not the result of great effort or smarts—unless, somehow, it took effort or smarts to be born to affluent parents. This fact about inequality naturally leads to Piketty’s main policy solution—higher income taxes on the very wealthy and a wealth tax. If high incomes are not earned, if they are the result of luck or getting a large inheritance, then high tax rates on income are less objectionable because they don’t distort economic incentives very much. On the other hand, they will have many positive effects if they succeed in reducing inequality. And if wealth inequality has negative economic and social effects, a case exists for a wealth tax. Milanovic has written a lengthy and brilliant review of Piketty that will appear in the June 2014 issue of the Journal of Economic Literature, one of the premier journals in economics. It is published by the American Economic Association, and it publishes literature surveys and long reviews of books that the editors regard as especially important. For those unable to wait until June, and for those who do not subscribe to the Journal of Economic Literature, an early draft of this review is available here. Milanovic calls Capital in the Twenty-First Century “one of the watershed books in economic thinking”. He then goes on to explain why. His review demonstrates both a careful reading of Capital and a detailed knowledge of Piketty’s previous work. It explains that the value added by Capital is a “general theory of capitalism”. In brief, Piketty shows that annual returns to capital income (which mainly go to the very wealthiest households) have been relatively constant at 4%-5% over long historical stretches and have exceeded the annual rate of economic growth, whose gains go to average households. The result must be greater inequality, as more income gains go to the wealthy than go to other families. There are few notable exceptions to this trend—wars leading to the destruction of capital and high tax rates in order to finance the fighting, and periods of hyperinflation that destroy wealth. During the Golden Era, the post-war decades, high taxes on high incomes and wealth reduced income equality and led to a rising middle class. But such brief historical epochs are aberrations according to Piketty; the dynamics of capitalism tend to return to long-term trends. Rising inequality is inevitable due to the math of returns to capital that exceed economic growth rates. As a further benefit, Milanovic’s review compares Piketty and the views of other top economist who have recently written about broad historical trends in growth and inequality. While others see the past century “as the dawn of even better days to come” and history as leading to economic gains for average families, Piketty sees the advances made during post-war decades as temporary and unlikely to return. Piketty stands virtually alone in seeing capitalism an economic system that generates widening income inequality; as a result, most families can look forward to income stagnation as gains from economic growth go primarily to the filthy rich. Solow has written a wonderful review of Piketty in The New Republic (Piketty Is Right) that was published on April 22nd. It focuses to a large extent on the data that Piketty has collected and the claim (based on this data) that inequality has an inexorable tendency to rise in capitalism. Solow praises Piketty for having gathered important economic data stretching back many centuries; however, he is highly critical of the claim that inequality must rise under capitalism. His main point is that Piketty has provided historical evidence about past trends but, as mutual funds all warn, there is no guarantee that past results will continue into the future. For this, a theory about returns to capital is necessary. 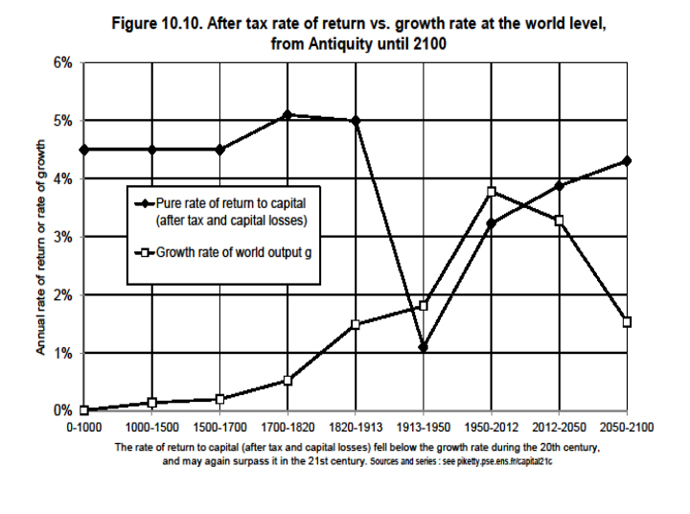 Following along the lines of his theoretical work on economic growth, which earned him a Nobel Prize, Solow claims that diminishing returns to capital should reduce the returns to rentiers over time and counter any tendency for inequality to rise under capitalism. In contrast to Piketty, Solow sees things returning naturally to a somewhat steady state, where the distribution of income between capital and labor remains relatively constant over time. My next post will consider some other critiques of Piketty’s book and its bleak prognosis.